This bracelet is the first finished item in my Honeycomb Beadwork series. The series is based on motifs that begin with a row of RAW but then move onto using peyote stitch with increasingly larger beads. As each one is beaded it is joined to the previous one. 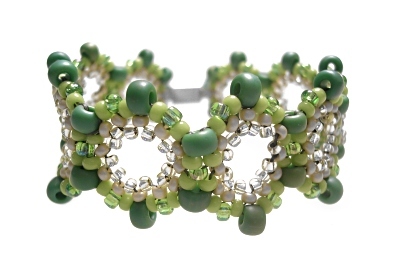 This bracelet was the first thing I beaded with the technique and is made up of nine six-sided motifs. I used a silver box clasp to fasten it, but wanted to see if I could bead another variation using a beaded fastening. A necklace which was a variation of the technique was featured in the February/ March 2006 issue of Beadwork Magazine.